The One who is the originator of all creation. The One who is the founder of creation. The One who begins all things. The One who initiates all creation. The term Mubdi' is not specifically used as a Beautiful Name in the Qur'ân. 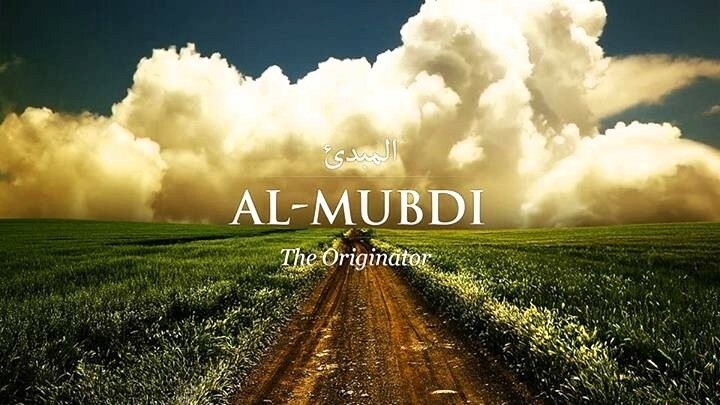 al-Mubdi' (the Beginner) al-Mu'îd (the Restorer) - these terms mean the One who bestows existence, and when this origination is not preceded by something like it, it is called a beginning; but when it is preceded by something like it, then it is called restoration.... all things began with Him and are restored to Him; began in Him and in Him are restored. In some Classical Arabic literature, the participles Mubdi' and Badî' are used interchangeably. However, in many Qur'ân commentaries, these terms are used to describe slightly different attributes, with the name Mubdi' emphasizing the initiation of creation, while Badî' emphasizes the awesome innovation of such creation. Mubdi' is the One who initiates, starts or begins the production or creation of all things. Badî' is the One who creates in awesome, wonderful, amazingly original ways that have no precedent whatsoever. Mu'îd is the One who repeats, restores and revives that which had been previously invented. Bâri' is the way the One works with substances, often creating from existing matter, making and evolving that which is free and clear of imperfections, free and clear of any other thing. Khâliq is the One who continues to plan, measure out and create and who has the power to change things from one state to another, in and out of existence. Musawwir is the One who arranges forms and colors, and who is the shaper of beauty.